Select your objects and lights, choose I/E ops and check "Transfer..."
(if you like) to move existing obj(s) into the new I/E List. Works on all geometry + renderable shapes (as original I/E feature designed). [*] Just to transfer obj(s) b/w I/E lists - select lights only and check "Transfer..."
[*] Just to clean-up I/E list - select lights only and uncheck "Transfer..."
[*] "Clean" button will empty the I/E list keeping the rest I/E settings intact. Submitted by Anubis on Tue, 2011-05-03 15:37. I not work with VRay and am almost sure you need to modify the code to work with vr-lights 'cause the properties names are different there. As tip will say - you need to find out the equivalent props of includeList, excludeList, inclExclType in your vr-lights. Submitted by shirak23 on Tue, 2011-05-03 13:23. Will this work with VRay lights? Submitted by Anubis on Sat, 2010-04-24 20:43. Submitted by veneta on Sat, 2010-04-24 19:00. You're big man, thanks ! Submitted by noel_d3 on Sat, 2010-02-20 03:42. Submitted by Anubis on Wed, 2010-02-17 09:52. Hi Titane, first, yes, to make "clean" button not just clone feature I make it to work lightly different. Push "clean" will empty the current light list without change any settings, i.e. 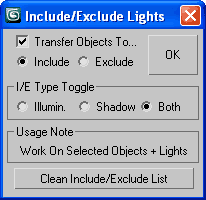 for example - if you have 2 lights selected, one has "include" and second has "exclude" then the script will empty the "include" list for the first and "exclude" list for the second light. Just simple (I hope), so not need to play with other dialog settings, i.e. "clean" button is come as independent (from the rest ui controls) action. And if you use "ok" button (with "transfer" off) then also will empty the lists, but the I/E list will toggle to chosen (I/E) and type will set to chosen (I/S/B) too. If you still have in trouble with my description, then just make a few test (playing with the options) on 2 selected lights and after each test open their I/E list to see the result. But of course if something I can help, feel free to ask me. Submitted by titane357 on Wed, 2010-02-17 01:05. - to include all lights with "clean" button, you must first check "include" and click "ok" then click "clean"
Submitted by Anubis on Tue, 2010-02-16 14:16. Updated version 1.2 is in the attachment list, enjoy! Submitted by titane357 on Tue, 2010-02-16 10:03. Submitted by Anubis on Sat, 2010-02-13 06:58. Script updated - added Include/Exclude type toggle.